OAKLAND, CALIFORNIA - (June 5, 2017) - Comfy, a leading workplace software developer, today announced that it has been recognized as a "Cool Vendor" in the Digital Workplace by Gartner, the world's leading IT research firm. Comfy’s software lives at the nexus of the digital and physical space by granting people greater control and personalization over their physical comfort in the office. For example, with the Comfy app, anyone can request and instantly receive warm or cool air where and when they need it. Comfy has attracted over $18 million in funding from investors such as Emergence Capital, CBRE Group, Inc., Microsoft Ventures, Claremont Creek Ventures, Westly Group, and Google Ventures. 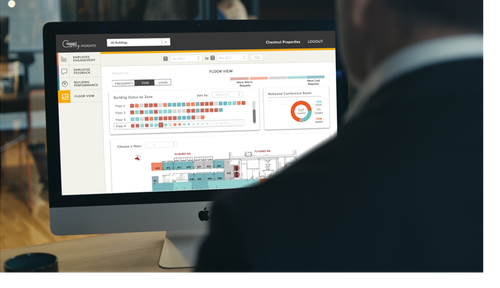 In January, it announced the launch of Comfy Insights, a new tool that utilizes data on building performance and employee behavior to create actionable analytics for corporate real estate leaders. In April, it announced a number of location-based product enhancements, aimed at making it easier for employees to request comfort from multiple locations and devices. Comfy's distinctive ability to combine data from its "employee-facing" app and data from existing building management systems to create a multilayered perspective of how occupants engage with their buildings was noted in the Gartner report. “We are honored to be named a 2017 Cool Vendor by Gartner,” said Stephen Dawson-Haggerty, CTO of Comfy. "We believe our inclusion is a great validation that Comfy is filling a necessary gap in the marketplace with our ability to engage employees and improve business performance with meaningful data. The future workplace must leverage advanced technology to understand, predict, and accommodate employees' preferences. We're proud to be leading that charge at Comfy.” Dawson-Haggerty will be discussing the next generation of Commercial Real Estate Tech and more at RealComm's pre-conference CIO Roundtable on June 13th. Comfy is a growth-stage enterprise SaaS company on a mission to create exceptional workplace experiences that are better for people, better for business, and better for tomorrow. With deep roots in advanced computing and thoughtful user experience, and living at the nexus of the digital world and physical space, our Oakland-based team of nerds dreams up unconventional software solutions for everyone—from the people who operate the building to the people who fill it. Visit comfyapp.com for more information.